The Non Slip Mat from Kampa is a fantastic accessory ideal for any circumstances. It can be used as seen in the picture for transporting food on a tray, some other great uses are on your car dash board for you phone and keys etc, at an eating table, on a boat, under a fish bowl and so much more. 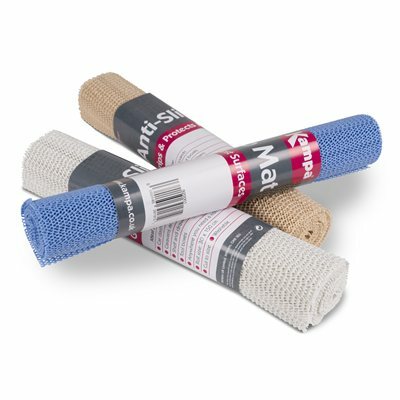 The non slip mat is machine washable and can easily be cut to any size needed, it comes in a roll of a 150cm by 30cm and offers a range of colours to suit your taste. The Non Slip Mat is sent to us in mixed colour cartons containing Grey, Brown, Sand, Green, Beige and Red. If you would like a specific colour then please specifiy in your customer order notes at checkout. Stock depending we will always do our best to get you the colour you ask for. helpful product - particularly if your campsite is not level. ours looked level, but heavy things would slide down the table until we used the non slip mat, which kept everything in place including wine bottles.